A group of former Six Flags Great America employees have raised serious questions about the way first aid is delivered by the Gurnee park, NBC5 Investigates has found. "I’ve seen strokes, I’ve seen seizures, I’ve seen femur fractures," said Stephanie Galiardo. "Everything from stubbed toes all the way up to cardiac arrest," added Dinah Tonne. Six Flags hired Karen Wilkison, Stephanie Galiardo and Dinah Tonne to give first aid at the park. "I would say the quality of care we were forced to give is not good," said Karen Wilkison. The former employees are Emergency Medical Technicians (EMT’s) or Paramedics. Some worked at the park as early as 2008 and others as recently as 2011. They and seven other colleagues with whom NBC Chicago spoke, including one who still works there, said too often park officials pressured them not to call 911. "It came from management and they did not want to up their numbers when it came to calling 911," said Wilkison. 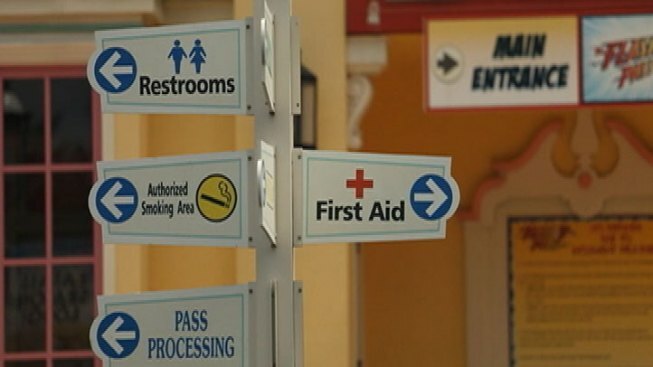 The former park employees say sometimes Six Flags was more concerned about its image than providing proper medical care. "They don’t want to make it seem like the park is unsafe. They don’t want the presence of paramedics and ambulances on scene," added Wilkison. They also say Six Flags dispatchers would not give them crucial medical information over the radio as they responded to a call for fear someone outside the park might hear about an accident or injury. "We would ask, 'What is the nature of the injury or the illness? We need to know so that we know which crew to send out there,' and they would just respond, 'Guest illness' or 'Guest injury,'" said Galiardo. "It makes the park look bad. They don’t want the public knowing what goes on at the park." The women told us they sent their concerns in writing to park officials in April 2012 and also complained about a notice requiring a managers approval to transport employees in need of medical care, saying those managers weren’t as qualified as they were to make a medical decision. They also said the people in charge of emergency care at Six Flags were not doctors, paramedics or EMTs. Six Flags declined a request for an interview but in a written statement said, "We conform to, or exceed, all local, state and federal standards for emergency care." The company also said their medical care program is reviewed by an emergency room doctor off site. Officials said their top priority at Six Flags is the safety of our guests and employees, adding: "We would be both appalled and disappointed if NBC were to run a sensationalist story based on unsubstantiated statements by one or more forger disgruntled employees." We asked if the women were former employees striking back at the park. "I’m upset about how patient care was delivered but that’s the extent of it. We don’t want to get back at the park. That’s why we tried to keep it internal by going through the chain of command. The media was not our first avenue,” said Galiardo. "I’m speaking out now because I will never be able to forgive myself if someone got severely injured or worse died and I knew about this and did nothing about it,” added Wilkison. We asked Six flags what changes were made and they responded that they would have no further comment.